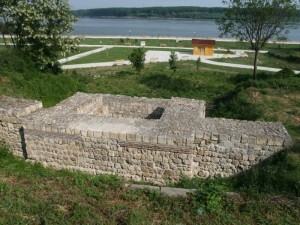 Roman Transmarisca is situated under the present-day Danube town of Tutrakan in Northeastern Bulgaria. Regular archaeological research has been carried out since the end of the 1980s to date. The Roman settlement was found in the late 1st century AD. No fortification facilities dated earlier than the period of the Tetrarchy have been uncovered yet. Parts of the northern (with two quadrangular towers, gate and postern) and western (with U-shaped and fan-shaped towers) fortification walls of the Late Roman fortress, built by order of the Emperor Diocletian, have been explored. The fortified area covers about 65 decares. Transmarisca had an important role on the Lower Danube limes by the end of the 6th century AD.